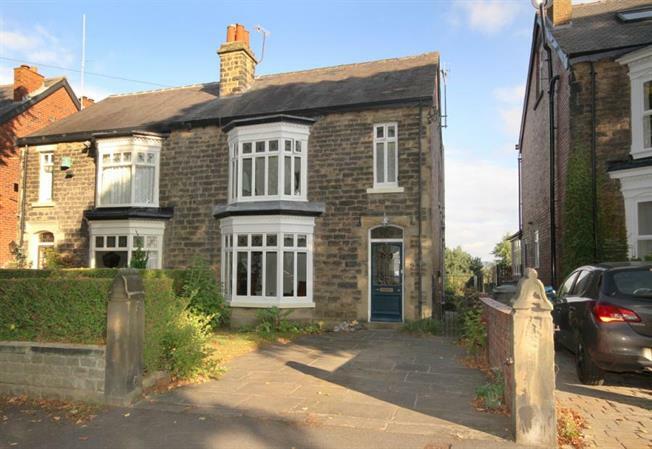 4 Bedroom Semi Detached House For Sale in Sheffield for Guide Price £365,000. Guide Price 365,000 - 380,000. A fantastic opportunity has arisen to acquire this imposing four bedroom stone fronted Edwardian residence located on what is undoubtedly one of the areas most regarded and sought after tree lined residential roads within this highly regarded suburb. The area is served by a comprehensive range of excellent local amenities and within catchment for popular junior & secondary schools. The property offers extensive light and airy flowing living accommodation over two floors with further scope and development possibilities to convert the workshop basement cellars and attic loft areas to living accommodation if required and subject to appropriate consents. The attractive front entrance door opens to the inviting main reception hall. Living Room: Having a lovely walk in bay window providing ample natural light throughout. Focal point of the room is the feature fire surround set to the original chimney breast. Dining Room: A pleasant formal dining room having fabulous views over the gardens. Breakfasting Kitchen: The light and airy fitted kitchen has a comprehensive range of modern wall and base units with extensive work top surfacing. The breakfasting area is ideal for families with garden access. Basement Workshop Cellars: From the imposing main reception hall a neatly concealed secret door opens to a staircase leading down to the large basement cellars and work shop. These subterranean cellars provide scope and development possibilities for further accommodation subject to appropriate consents. Staircase from the entrance hall to the first floor landing. Master Bedroom: A large light and airy room having a deep walk in bay window. Double Bedroom Two: A lovely bedroom having fabulous far reaching views which must be seen. Bedroom Three: Another light room with far reaching views. Bedroom Four: A pleasant bedroom with views over the front gardens. Exterior & Gardens: Driveway to the front of the property provides ample off road vehicular parking adjoined by a lovely mature front garden. Pathway provides access to the main entrance door. Side pathway leads past the property to the rear. Private sun terrace area with stunning far reaching views. Steps descend to the charming privately enclosed mature rear gardens having a vast array of colourful flowering plants and shrubs.